f(t) has its very own Best Of page! My little blog is all grown up. Next thing you know it will be getting its own top level domain and growing facial hair. Those who have been around for a while will probably not think it's too exciting, but I thought it might be useful for newbs. I spent all of 20 minutes on it, so let me know if I missed one of your faves. Enjoy! I'm looking forward to it because I have a problem to pose that the kids will dig. That I am shamelessly stealing from Jason Dyer. I'm sure you see where this is going. 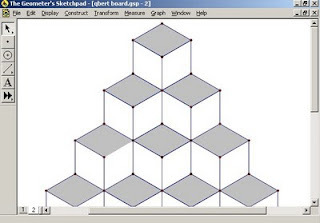 QBert starts at the top. How many ways to get to any block? 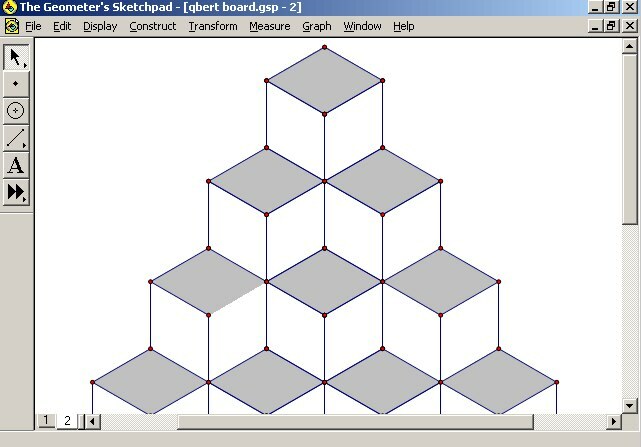 I used Geometer's Sketchpad and made them a beautiful blank QBert board to scribble on. I figured out how to do it with iterated transformations. It was exhilarating. In an ideal world the curious cherubs will count pathways and write them down and notice some patterns! And think it's cool and try to explain mathematically where those patterns came from and everything will be lovely and we will break into song like we're in a Disney TV film about a high school where everyone is happy all the time and even when they are not happy they only have problems which you might describe as adorable. I dread it because this is what will happen in my world: they will get confused looks on their faces for 5 seconds. Then they will start talking about unrelated topics. I will say "How can I help you?" They will want me to show them what to do. I will resist. I will say "How many paths can he take to this close block right here?" They will say 2. They will write it down. They will get confused looks on their faces for 5 seconds. They will start talking about unrelated topics. I will try to prod them along to listing out the rights and lefts. I will say the words "right" and "left" approximately 900,000 times. Each. We will waste 20 minutes. I will feel like the world's crappiest math teacher. I will whine about it on my blog. I will try something similar next week.